Dante Alighieri, Inferno, chapter X, lines 133 - 136, published in 1321. Nowhere else in Dante’s Divine Comedy the inspiration from the hot, steaming grounds of Valle del Diavolo is more obvious than with the description of the sixth circle inside the hell's city of Dis. There, the heretics are suffering in half-open, flaming tombs. Steam and sulfur stench move all over the barren land. Dante Alighieri was Tuscan, born 1265 in Florence, and for sure he visited Valle del Diavolo, which is located only 60 km (37 miles) southwest of his place of birth, more than once. Surrounded by the Colline Metallifere (metal-bearing hills), Valle del Diavolo extends from San Dalmazio in the northeast via Montecerboli and Larderello through to Castelnuovo di Val di Cecina in the south. 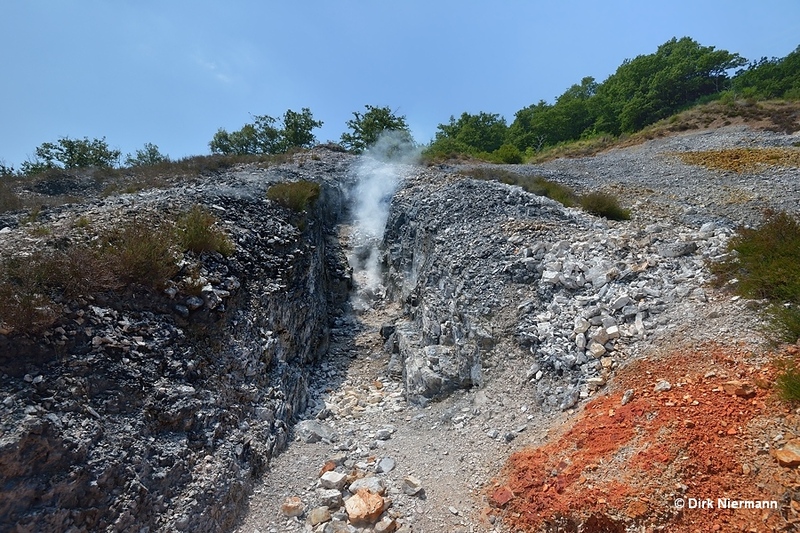 The geothermal parks of Sasso Pisano and Monterotondo Marittimo lie close to the very south edge of the valley. 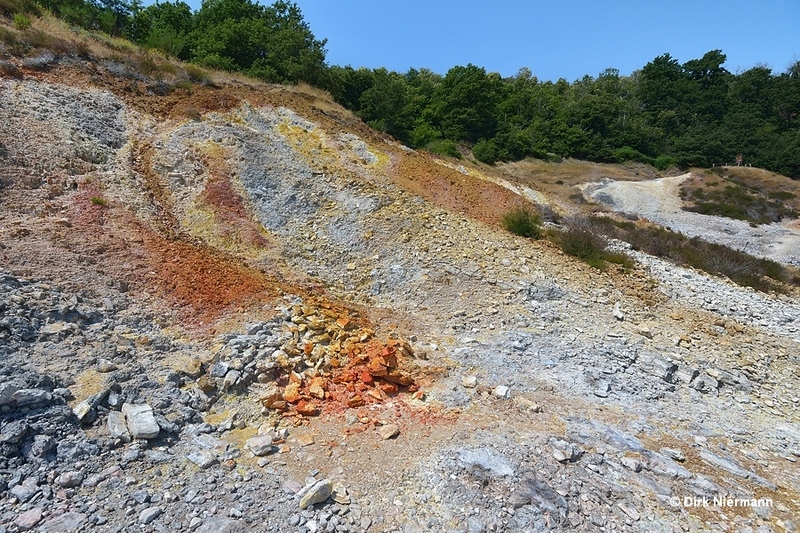 All geothermal features in the area are fed by a subterranean, pressurized reservoir, consisting of 85 % superheated steam and 15 % gases at temperatures between 150 and 260 °C (300 - 500 °F), which is part of the dormant volcano Larderello. 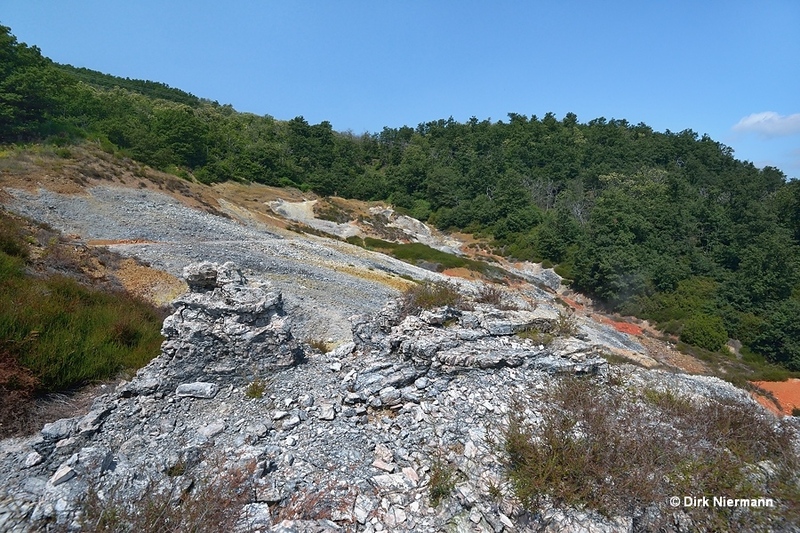 Between Sasso Pisano in the north and Monterotondo Marittimo in the south one of the last near-natural spots with geothermal features in the Larderello region is preserved. However, even here traces of human interference are visible almost everywhere, but it is easily possible to ignore them and to imagine how the area must have looked like in a pristine state. 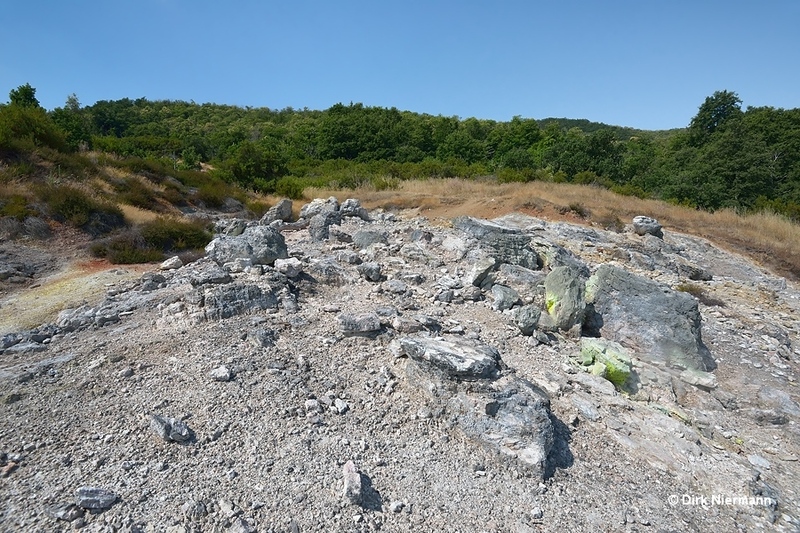 It was the quarrying of mineral deposits, mainly sulfur, vitriol (copper(II) sulfate), boric acid, and alum (hydrated potassium aluminium sulfate) wherein different stakeholders have been interested for ages and that made them to fight fiercely for in the 15th centrury. The parking lot of Parco delle Fumarole northwest of the small village of Sasso Pisano is well-signposted. 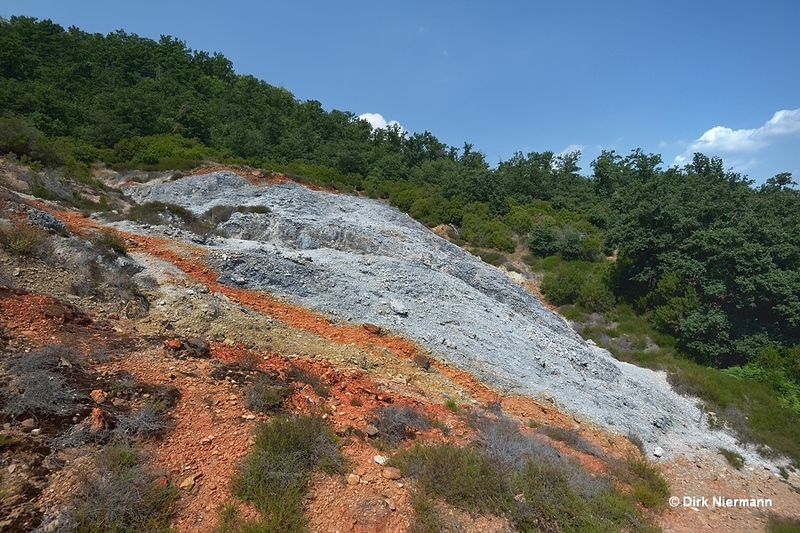 From there you follow a narrow trail upslope to the geothermally active spots, called biancane (white ground). The reason for the name becomes obvious very soon. 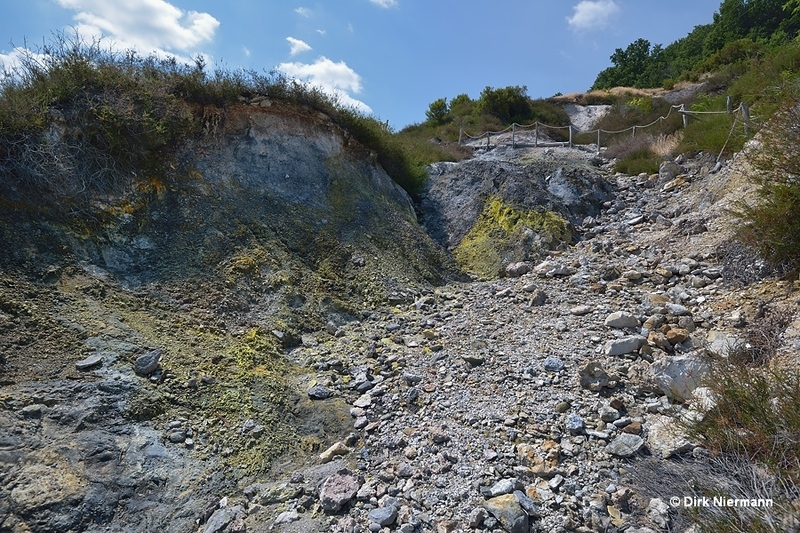 Besides hot steam the cracks in the ground release a mixture of other gases such as carbon dioxide, methane, ammonia, boric acid, hydrogen sulfide, hydrogen, nitrogen, and radon. They form some chemically reactive compounds which are bleaching the limestone and jaspers bedrock through to a snow-white color. In the area different manifestations of geothermal features are to be found. Most common are solfataras, recognizable by bright yellow sulfur deposits, mainly in form of tiny crystal needles, around the vent. 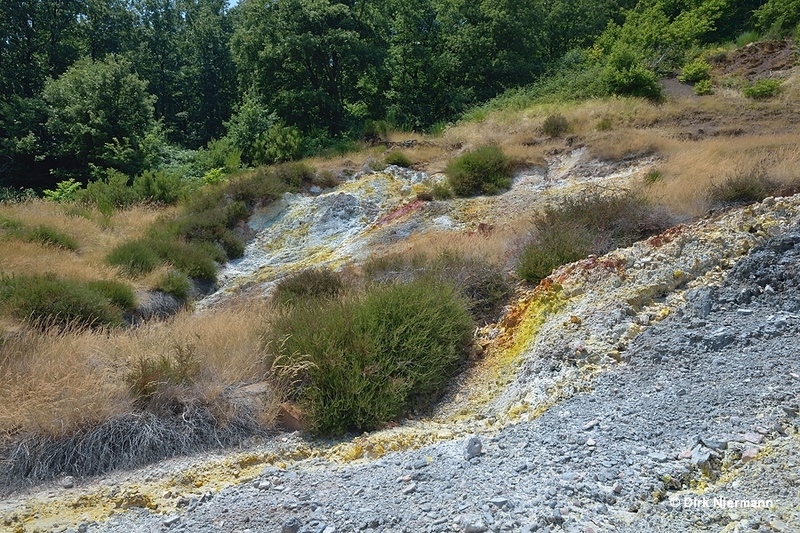 At other places solfataras deposit sulfur in form of earthy plaques. 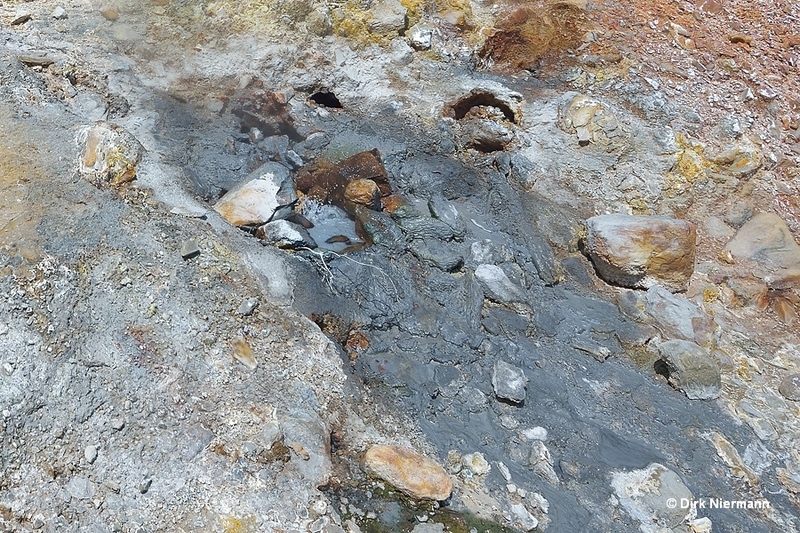 The only difference between solfataras and fumaroles is the missing sulfur deposit of the fumarole. 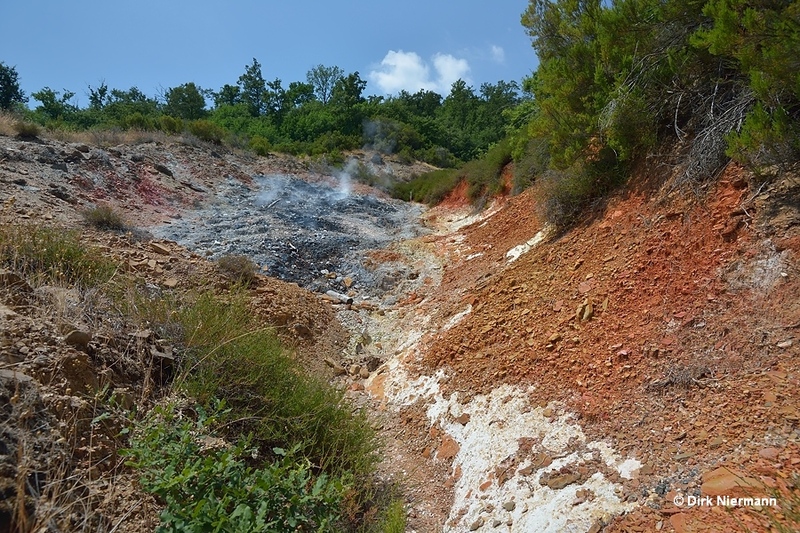 Otherwise fumaroles emit the same mixture of non-pressurized hot steam, hydrocarbons (methane, ethane, ... up to C10, cyclics and aromatics) and hydrogen sulfide as solfataras do. Therefore, recent science does no longer differentiate between both types but uses only the term fumarole as an umbrella name. A thermometer (or the bare skin, but caution!) 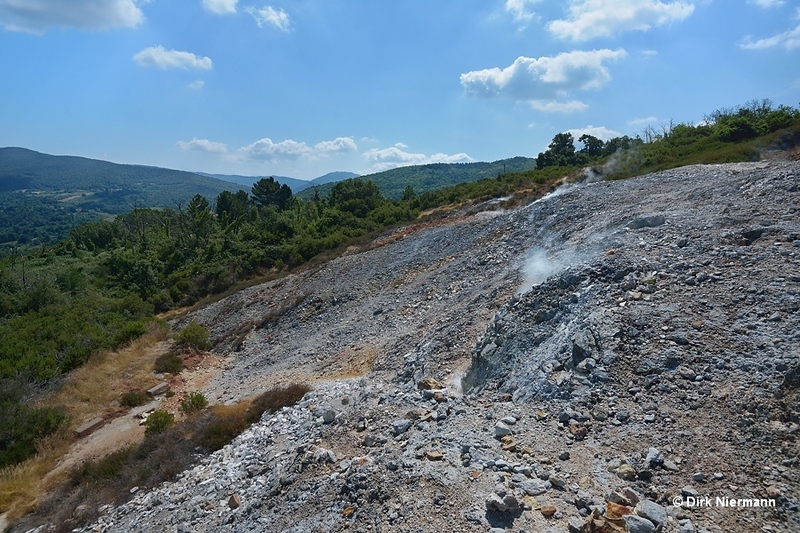 is needed to distinguish between fumaroles and mofette. In contrast to a fumarole, a mofetta emits hydrocarbons, other gases of volcanic origin, and a low amount of steam at low temperatures. On a warm, dry summer day the activity of a dry mofetta is as good as invisible. Nevertheless, some danger may be included if mofette are placed on the bottom of a depression. Hydrocarbons are heavier than air and may displace oxygen up to the height of a person or more if there is no discharge into the surroundings. All geothermal features discussed so far were not pressurized. But in the area also pressurized steam and gas emissions do occur, even if they are rare. A so-called soffione jets steam and gases at a pressure above 20 bar and a temperature up to 230 °C (450 °F) high into the air. Sometimes the eruption column reaches a height of 20 m (65 feet). Soffioni may show steady activity or geyser-type, intermittent eruptions. Nowadays, they are in almost all cases generated by drill holes. Information boards along the trail do also state the appearance of geysers, lagoni (hot springs, bubbling by steam and gas emissions), and sorgenti termali (warm springs, often bluish clouded by suspended minerals). But we found none of them in Parco delle Fumarole, maybe because we overlooked some hidden spots, or the features were dried out in summer, or the boards refer to the past. On a large biancane at the southern border of the park, where it merges into the Le Biancane Nature Park of Monterotondo Marittimo, some ancient cones of hot springs stand out. This biancane comes with exceptionally colorful deposits of sulfur and brick-red jasper. Finally, we detected a bullicame, a small mud pot, constantly splashing by gas emissions.